Note: Numbers do not add to 100% due to rounding. Source: CICH graphic created using data adapted from Statistics Canada – 2011 Census. Catalogue Number 98-314-XCB2011042. https://www12.statcan.gc.ca/census-recensement/2011/dp-pd/tbt-tt/Rp-eng.cfm?LANG=E&APATH=3&DETAIL=0&DIM=0&FL=A&FREE=0&GC=0&GID=0&GK=0&GRP=1&PID=103089&PRID=10&PTYPE=101955&S=0&SHOWALL=0&SUB=0&Temporal=2011&THEME=90&VID=0&VNAMEE=&VNAMEF= -accessed March 19, 2017. Sixty-four percent of young children under five live in households where the primary language spoken is English. Almost 20% live in homes where French is the primary language, while over 12% live in homes where the language most often spoken is neither English nor French. 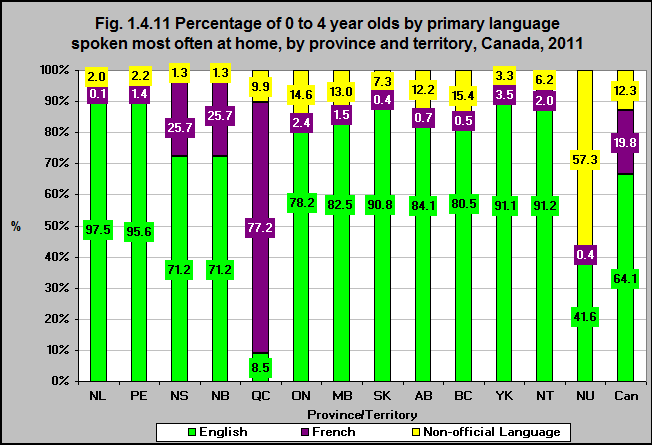 In Quebec just under 9% of young children live in homes where English is the primary language. French is the primary language in 77% of homes and another language is the primary language in almost 10% of homes. In Ontario and British Columbia 15% of young children live in homes where a language other than English or French is the primary language – that is the case for 57% of children in Nunavut. The relatively large proportion of Canadian children who speak another language other than English or French at home is a reflection of immigration patterns overall and highlights the growing diversity of the population living in Canada. Meeting the needs of children from diverse linguistic backgrounds is an important challenge for all support systems – particularly for the provision of quality early childcare and education programs. These programs can have a significant impact on the healthy development of young children.